Are you new to basket making or always wanted to take a workshop? Made baskets in the past? Come cut your teeth on a challenging and rewarding beginning basket. Come brush up on your skills and learn some new techniques and perspectives about basket making. 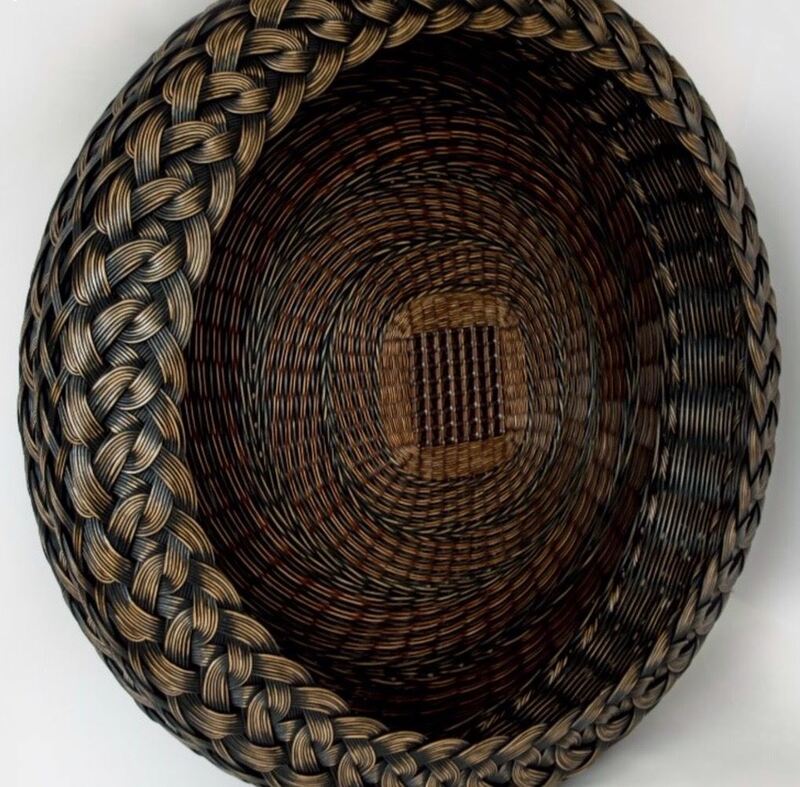 Immerse yourself in a 2 day, all-inclusive basketry workshop! Students will learn the twining technique, the fundamentals of materials selection, basket shaping, and the importance of tension while making an approximate 15" diameter x 3" tall basket. The split spoke and twined construction of this basket base will boast a colorful spiral pattern. Students will have vibrant colors to choose from for the basket base. All round reed will be pre-dyed and prepared for this specific project. The basket will be made from multiple diameters of round reed which lend additional textural interest. DAY ONE: Students will make a woven base for the basket. Most likely students will move onto the next step of inserting the side spokes to work up the sides of the basket. Students will focus on the twining technique, the importance of tension on the weaving materials, keeping base spokes evenly spaced and how to create a dome and why it is an important function of a basket base. DAY TWO: Students will complete adding side spokes and finish up the side weaving. Students will be focusing on the tension of the weaving materials and how to bring shape to the basket. This will then lead students to creating a substantial border which brings the basket to completion. Materials: $105 (collected at registration for the class). Students will receive supplies for 2 baskets. One basket will be made during the workshop. The additional materials will be provided to take home to make another basket while the techniques are fresh at hand! All tools needed will be provided for students to use during the 2 day workshop. Students Need to Bring: Bring 1-2 old bath towels and hand cream. The dye may come off on your hands and clothes so it’s best to wear comfortable old work clothes, and layers for warmth. Skill Level: Universal. All skill levels welcome. Hand strength is required. Instructor Bio: Peeta Tinay grew up in the San Francisco Bay Area. She was born into a family of creatives: her father a chemist by day and a jeweler by night, her mother a painter and weaver. Art work from both parents and their friends filled the house throughout her childhood. Her grandfather was an inventor, keeping a fully functional foundry and pattern shop behind the family home. Roaming through his old work buildings was always an adventure. This early creative environment was fertile ground through which she came of age and discovered her life’s work. From 1990 to 2000 at The Caning Shop in Berkeley California she was introduced to techniques involved in the restoration of wicker furniture. In 2000 a move to Washington gave a fresh start motivating her to branch out. She continued restoration work and also started making wicker pieces from the ground up using 1920's wicker as inspiration. Artist Statement: I spent the first two decades of my career learning and refining restoration techniques of antique and contemporary wicker furniture. In 2011, at age 43, a cathartic personal discovery about my birth and heritage threw open a door to creativity and set my work on a new and unexpected course. This experience provided the catalyst I needed to start creating my own designs for the baskets I make. I am inspired by techniques from antique wicker furniture, passementerie and anything exceptionally made and beautiful finished. Repeating patterns intentional and unintentional always catch my eye for a second look. My basketry projects combine a variety of weaving techniques including twining, plaiting and lashing. I now prefer to create large works, moving beyond previously held notions of scale and proportion. Fine detail is achieved by using small-diameter round reed in the beginning stages of weaving which eventually transitions to larger reed. The combination of bold scale and fine detail are, to me, simply sublime. When plaiting with flat reed, I discovered additional interest by using multiple layers - juxtaposing interior and exterior colors that draw the observer deeper into the work. Cellulose fiber dyes are hand-blended creating either natural hues or vibrant colors. Finishing steps include a UV archival varnish and a hand-buffed wax finish. From weaving techniques using a variety of materials to replicating complex finishes using paints, stains and dyes, my skills are continuously expanding. Reed, the primary material used in antique woven furniture, is the material I have chosen to use in all my projects. Derived from the vine rattan palm, it has been a workhorse in the production of handwoven wicker furniture since the 1880’s which ushered in America’s Golden Age of wicker furniture production. The versatility and resilience of this amazing material gives each new project infinite possibilities. I feel that my current work captures and showcases all of my skills with reference to design and technique. I will continue to evolve as a craftswoman, seeking excellence in my work and within myself.